The son of General Albert Coady Wedemeyer, he was born in 1926. His wife, Dorothy Davenport Wedemeyer, is buried here. Albert Dunbar Wedemeyer, 80, a decorated Korean War veteran who retired in 1986 after 28 years as an officer with the Central Intelligence Agency's Directorate of Operations, died of leukemia May 5, 2006, at his home in Vienna, Virginia. During his career with the CIA, Mr. Wedemeyer had assignments in Venezuela, Chile, Panama and Mexico. In retirement, he served on the board of directors of the CIA Retirement Association. Captain Wedemeyer was born in Washington and graduated from Woodrow Wilson High School. In 1946, he graduated from the U.S. Military Academy at West Point. After spending three years with occupation forces in Germany, he served with the 17th Infantry Regiment in the Korean War and received the Silver Star, the Bronze Star for valor and the Combat Infantryman's Badge. He was a member of St. Peter's Episcopal Church in Poolesville. His first wife, Dorothy Davenport Wedemeyer, died in 1992. They had been married for 39 years. Survivors include his wife of 10 years, Irma Wedemeyer of Vienna; three children from his first marriage, Albert S. Wedemeyer of Fairfax, William K. Wedemeyer of Pacifica, California, and Carol W. Humphries of Vienna; a brother; and eight grandchildren. 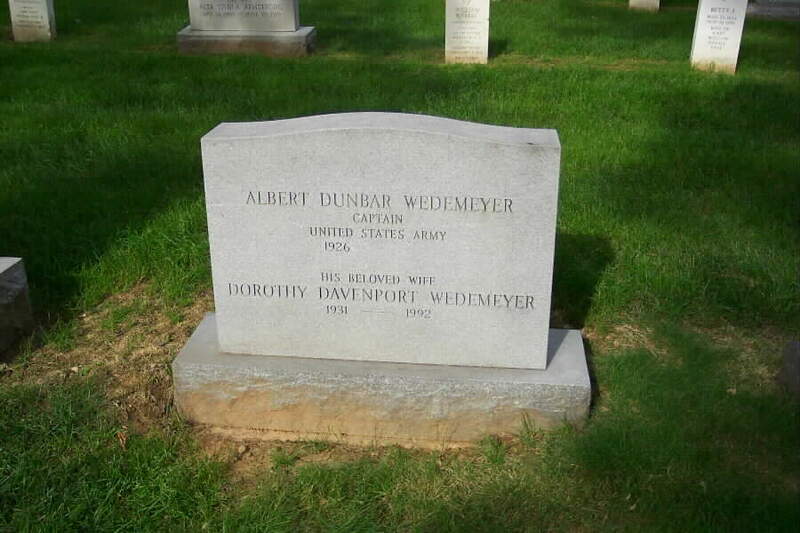 Captain Wedemeyer was laid to rest at Arlington National Cemetery on 2 June 2006.